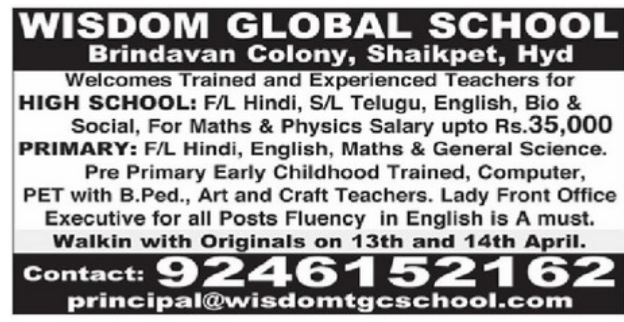 Wisdom Global School, Hyderabad has advertised in THE EENADU newspaper for recruitment of Trained and Experienced Teachers jobs vacancies. Interested and eligible job aspirants are requested to walk-in 13th,14th April 2018. Check out further more details below. 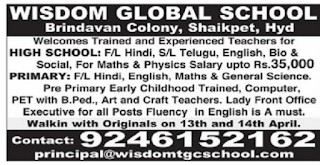 Name of the School: Wisdom Global School, Hyderabad. About School: Aims and aspirations of your child will fruition only by grooming and nurturing his thoughts, deeds in a right direction at the right time and right age. Our institution Wisdom the Global Concept School strives to create such environment for your child where his innate talents are recognized and groomed well to make your child a global leader. Our school intends to provide such a fertile ground where, all the energies of your child are channelized with motivation to reach the destiny in his life after school education. Imparting knowledge is not the only aim of any educational institution. Acquired knowledge will be utilized to the fullest extent only when used with WISDOM. Our school strives to impart such abilities by sowing the seeds of confidence, patience and hard work from young age in your child. Our efforts are towards making education really a weapon to transform a human-being from his passive existence to human excellence. We request your cooperation and blessings to be successful in our lives endeavours. (c) Executive for all posts fluency in english is a must. How to Apply: Walk-in with originals on 13th & 14th April.